After a long day in court, the Rivenburg family did not get the news they wanted to hear about Baby Steffen. Last week, a judge approved a temporary injunction to keep the 7 month old baby from being taken off life support. 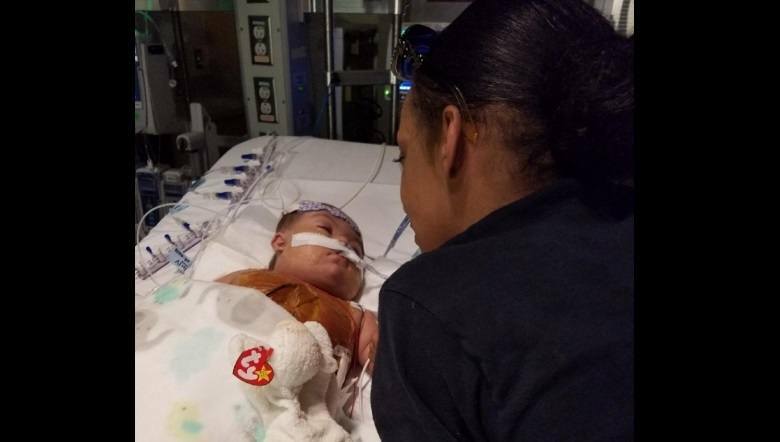 On Monday afternoon, Judge Wayne Shelton ruled that Baby Steffen's mother does not have the right to make the decision of whether or not to take him off of life support, and he denied the request to extend the injunction. The family has a short 24 hour, up to 48 hour, window to find a pediatric cardiologist in the South willing to testify that the baby is eligible for a heart transplant and would survive it. Unless they find such an expert, Vanderbilt doctors, not the parents, will decide when to take Baby Steffen off of the life support machine that is keeping him alive at this time. WHEN does the state decide over the parents wishes to take a baby, (LIVE PERSON) that is unable to speak for them selves decide over live and death????? What gives the state the right to decide these issues, the wishes of an activist judge??? or the parents!!!! Any answeres??? When the government is picking up the tab based on evidence based medicine instead of using emotion? I truly hope that they have their own private post mortem to prove the cause of this baby's illness leading to his tragic death. No cover-ups allowed. I agree there is something wrong, surely appears to be a cover up . . . As in if there is nothing to cover up, then why would Dr. Smith not READILY comply with the Court Orders? These orders are simple enough, and surely are no skin off his nose . . Why would a doctor in this position now OBSTRUCT JUSTICE in WILLFULLY FAILING to comply and uphold a court order, risking being sued for not doing so, while instead he can easily make the choice to UPHOLD the simple straight forward court order, and in so doing avoid being sued for NON COMPLIANCE when it is a LIFE & DEATH MATTER? If he is so confident that nothing further can be done to SAVE BABY STEFFEN. . then, what purpose is there to stand in the way of the second opinion and stand in the way of these orders??? . . particularly as this family has shown their own Due Deligence and their efforts . . what does he do . . This Dr. spits on the Rivenburgs efforts and violates not simply the Order, but violates each of the family members rights . . FUNDAMENTAL CIVIL LIBERTY RIGHTS fortified and protected by our U.S. Constitution and by U.S. SUpreme Court Rulings and Case Law. I don't suppose these parents, even if they could afford such an action and baby survive it, would be "allowed" to have their baby transported to a hospital in a state that recognizes the parents rights first in choosing right to life for their child in this situation? After all, this hospital and these doctors in possession of the baby at this time are surely not trusted by the family to give "the best care" even if ordered to do so by the judge, since this hospital and these doctors have strongly, firmly stated they want the baby removed from all support and care. That should be reason enough for any parent to have their child transported elsewhere, even if the risk of baby dieing in the process is great. The risk of baby dieing where they are at now is an absolute certainty. Another thing to question is the exact process they (the hospital/doctors) will carry out in forcing the death of this child. Who will be in the room. What will each persons roll be. Who will be the one who actually removes the support apparatus. The timing and procedure in determining death. I was told by the doctor that he would be the one to remove my daughter from life support and to determine death. However, when they did this to my child no doctor was in the room, only two nurses. It was a nurse who removed my daughter from life support and that same nurse who used a stethoscope to determine when her heart stopped beating and who declared time of death. This was also in a hospital in the south, where she ended up after being taken from her cancer treatment and stem cell transplant at Mayo in Rochester, MN. She too was put through numerous surgeries and experimental procedures in a teaching hospital (substandard to Mayo) in the south after being removed from Mayo by force. Know too that a hospital and it's doctors are not obligated in any way to even listen to another doctor from another facility. When my daughter's cancer expert from Mayo contacted the doctor in the hospital she had been forced to go to, they would not listen to him and instead carried on with their experimentation and no stem cell transplant, then decided when they would put her to death, all against my many pleas to resume her Mayo protocol, and then to keep her on life support when they were done with her. They very coldly refused without any hesitation whatsoever.